The theory explains that a broken window, if left unfixed for a period of time, symbolizes disorder and leads to more broken windows, triggering increased criminal activity. In the original 1982 article, the Broken Windows Theory was supported by the damage done to an intentionally-planted abandoned car in two completely different cultures. In the one neighborhood, theft and vandalism occurred within minutes of abandonment. Even in the “control group” neighborhood, once the person behind the test hit it with a sledgehammer, that vehicle was soon destroyed thoroughly. Doesn’t it make you wonder how else this theory can be applied? The theory implies one bit of chaos leads to another. One ounce of chaos will breed significantly if left unchecked, just as one broken window leads to increased crime if left unfixed. One dirty dish left on the counter leads to a stack of dirty dishes. One woman sharing her husband’s recent goof leads to a husband bashing session. One “cheat” on a diet with a brownie leads to a binge on doughnuts and cookies. Disturbing, isn’t it? The article hints at other ripple effects from broken windows: fear, disrespect for authority, and mob psychology. This reminds me that everything affects everything else, as The Butterfly Effect implies. One solid defense against this decay is ownership. Proactivity. Seeing a problem and taking care of it, whether it is your job or not. Ignoring problems is dangerous. Deal with chaos as soon as you see it brewing, or it may result in a storm which overshadows any sense of calm. Fix the broken windows as soon as possible to prevent mob psychology, rebellion, and disorder from setting in, even in your own mind. 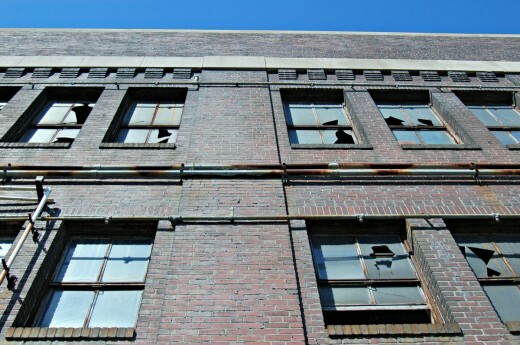 How do “broken windows” influence your actions? How do you respond to them? No sitting on the fence this time — pick a side! That’s a really great perspective. We’ve talked to our students about similar things, but on the spiritual side, i.e. our minds can easily become filled with decay if we do not proactively seek to renew them and take every thought captive. Thanks for sharing! This is a powerful application. Thank you for preparing your students to be aware of the consequences of their actions and thoughts — whether direct or indirect, good or bad!